The 3L Class Gift Program provides an opportunity for members of each graduating class to show their appreciation for the legal education they have received, the experiences they have had and the memories they have created during their time at Hofstra Law. Your gift will also shape the future of the programs and student organizations that enriched your life as a student. 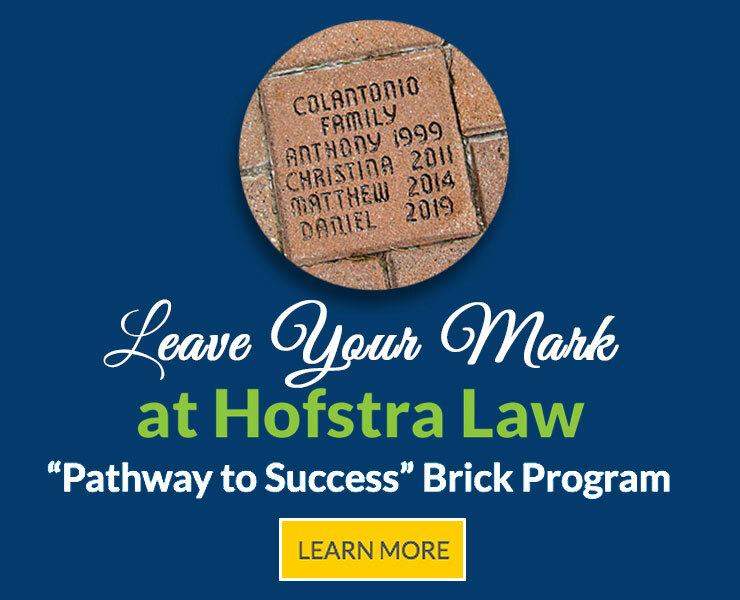 The Class Gift is your first opportunity as a soon-to-be Hofstra Law graduate to participate in a long legacy of alumni support at the Law School and to do your part to strengthen the value of a Hofstra Law degree. Also, by making your donation to the 3L Class Gift you are making a difference for your law school after you graduate. We all benefit from the support of alumni who came before us. Alumni participation, at any level, has a powerful impact on the reputation of our school and our reputation in the legal community. Each donation of $20.19 to Hofstra Law’s Class Gift Fund entitles you to one congratulatory message in a special booklet that will be given out at commencement. Thank your parents, professors, classmates or someone who has had a positive impact on your time at Hofstra Law. Each thank you can have a maximum of 30 words so that we have enough room for everyone’s messages. Have more to say? We would love for you to purchase multiple entries!